Open: Monday to Saturday 10 a.m. to 5 p.m. Last entrance is at 4:30. Closed Sundays, Christmas, New Year’s Day, and from the third week or November until the third week of December. Reduced ticket for children 6-12 and military personnel €5,00 Children under 6 and caretakers of the disabled are free. Beyond the third mile marker on the old Appian Way stands a yellow church, the Basilica of St. Sebastian Outside the Walls. 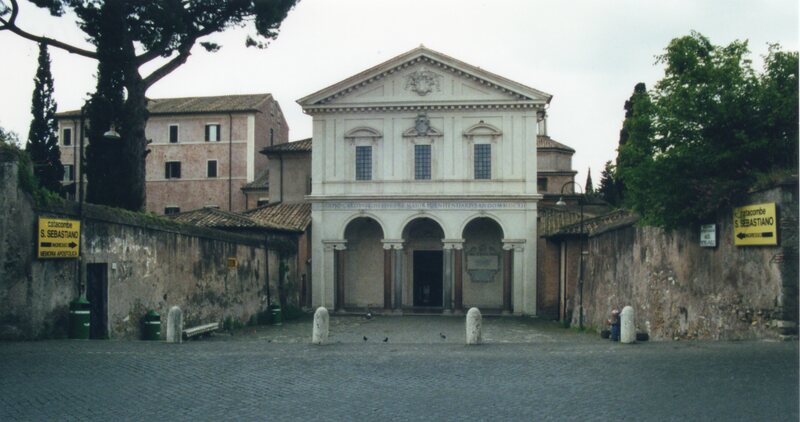 From the plaza, a door on your right leads to the Catacombe di San Sebastiano. Buy your ticket at a window barred like an old train station. The lobby occupies a long low room full of fragments of marble and terracotta, many clamped tightly to the brown walls. Each item has a bird, a fish, or a lamb: symbols of Christianity to people who couldn’t read. Guides of many languages lead tours of the catacombs, which you are not allowed to explore on your own. You’ll have to wait until there’s a large enough group that speaks your language before you begin. The tour passes through only a fraction of the second of the four levels of the catacombs. The other levels are unlocked only to archaeologists blessed by the Pontificia Commissione di Archaeologia Sacra, a bureau of the Vatican. You should know going in that there are no longer any bodies in the tunnels. Most were removed in the 4th and 5th centuries, when the catacombs suffered at the mercy of barbarian hordes that couldn’t breach the walls of Rome. Yellow globes, hung at intervals near the tunnel’s ceiling, do little to brighten the gloom. You might want to bring a flashlight. With its help, you’ll be able to see scars left on the ceiling by pickaxes. Early Christians called Fossores, special miners in service to the early church, excavated the catacomb by hand. The ground here is tufa, a lava rock that is easy to dig. They carried the earth away in baskets. The walls of the tunnel look as if bunks have been carved into the stone. The shallow niches are just large enough to tuck a body inside. The dead would be wound in a sheet and placed here without a coffin, then a slab of marble — if they were wealthy — or terracotta would seal them inside. The early Christians filled the graves on top first, then dug the floor down below them. In the tunnel where our tour group stood, the floor had been lowered five times. Try to conjure a sense of what the place must have been like when bodies filled it. There was, of course, no embalming in the Roman world of the second and third centuries. When people died, their survivors had to cart them out of Rome, since the Law of the Twelve Tables forbade burial inside the city walls. Most Romans would not have owned a horse or an ox, especially not Christians, who tended to come from the lower and slave classes. I suspect that transportation of a cadaver presented a pressing concern in the Roman summer. The pagan majority of Romans disposed of their dead by cremation. They burned corpses on a pyre, then collected the ashes into an urn. These urns of ashes were placed in tombs that lined the Appian Way, the road to Ostia through the Porta San Paolo, and all the other old roads leading out of Rome. Jews practiced inhumation — burial in earth — in observation of Genesis 3:19: “Earth you are and to Earth you shall return.” We hear it most commonly as “ashes to ashes, dust to dust” from the funeral service in the Book of Common Prayer. Early Christians pursued this custom, burying their dead because Christ had been placed whole in his tomb. Early Christians anticipated bodily resurrection, the way Christ had come back. Romans called a collection of graves a necropolis: a city of the dead. Christians, many of whom spoke Greek rather than Latin, referred to their burial places as coemeteria, equivalent to dormitories. The root of dormitory, of course, means to sleep. Christians believed that their dead were merely resting (ideally in peace) until Christ came again and ushered them into heaven. This is why we refer to a graveyard as a cemetery. Our guide led us into a room unlike any of the shadowy hallways we’d visited. Marble sheathed its floor. Its walls were whitewashed. In contrast to the rest of the catacomb, this room was brightly lit. On my left stood a simple stone table, draped with a spotless white cloth edged in lace. Across from that, on a pedestal, balanced a polished marble bust of a man in pain or ecstasy. Bernini, the architect who decorated St. Peter’s Basilica, carved the bust. Sebastian was a Roman soldier who decided he could no longer persecute Christians. 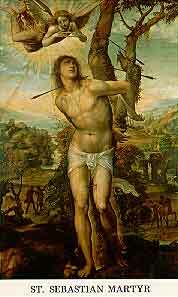 The other soldiers tied him to a tree and shot him with their arrows. They left him to die, but he recovered from his wounds and started to preach. They captured him a second time and killed him. Christians buried his body beneath this altar. 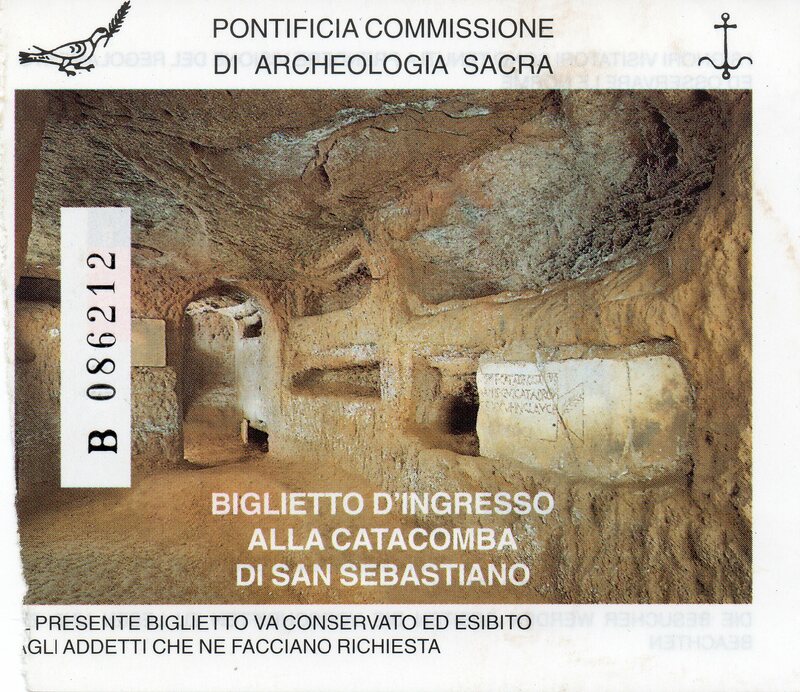 When Constantine converted to Christianity in 312, he had a church built above the catacombs and Saint Sebastian’s bones moved into the basilica, directly overhead. One of the relics stored in the basilica is an arrow embedded in part of the pillar against which Sebastian was bound. Our tour made one final stop. At some point during the excavation of the catacomb in the late 1800s, church archaeologists had discovered three Roman-era tombs. These little villas had been perfectly preserved when the low area where they stood had collapsed during an earthquake, then been been filled with rubble to support the church above. You can peer into these wonderfully preserved Roman tombs. Delicate mosaics brighten the surprisingly roomy interiors. One tomb had a staircase that stretched down to the tunnels below it. From this place, the word catacomb spread to refer to any hall of Christian tombs, from the ossuary in the quarry under Paris to the aboveground mausoleum complex at Cypress Lawn Cemetery in Colma, California. This entry was posted in Cemetery of the Week, Famous person's grave and tagged Appian Way, catacomb, Catacombe di San Sebastiano, Christian history, Christian saint, Italian cemetery, Rome cemetery. Bookmark the permalink. Thank you for the tour!! !